The stitches have been picked up on the edges and are set up to knit the tubing for my corded edge. This process is completed before I wash the top. Notice the cord loops in the corners; needle A, in the upper left corner, and needle B in the lower right corner. These loops free the cord, allowing me to pull the edges straight. To secure the pillow top in place, I use T pins. It works great. When dry, I will be knitting the tubing using the same method used for working with 2 circle needles in the round. You can find this method by typing in “socks on two circles,” or “knitting with two circle needles,” in you search engine. There are some good videos on YouTube. Thought you might like to see this-thought it might be helpful. 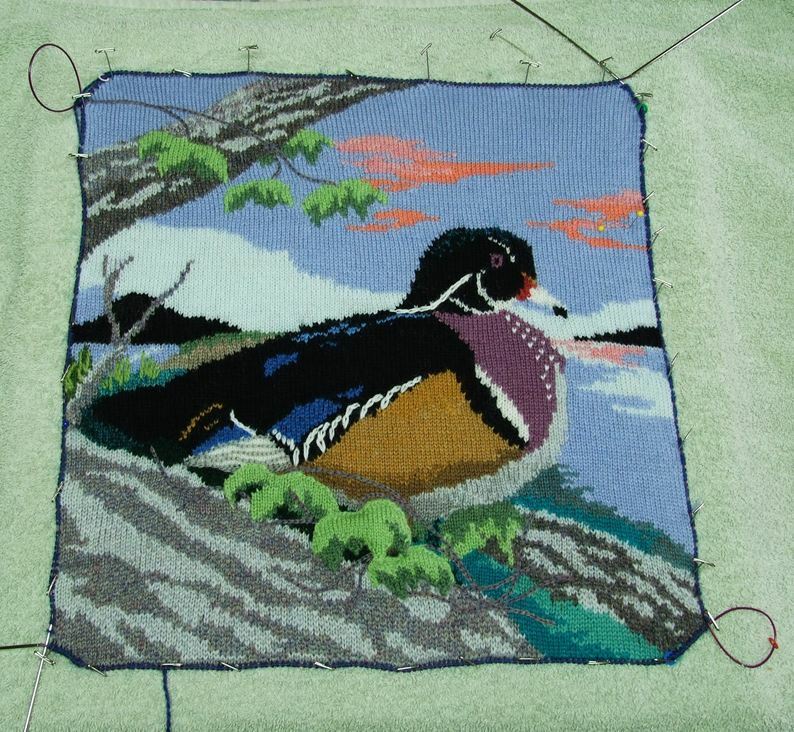 Unable to purchase all the necessary shades I needed to knit up the Wood Duck pillow for my grandson, I decided to make up my own by blending two single strands of colors together. 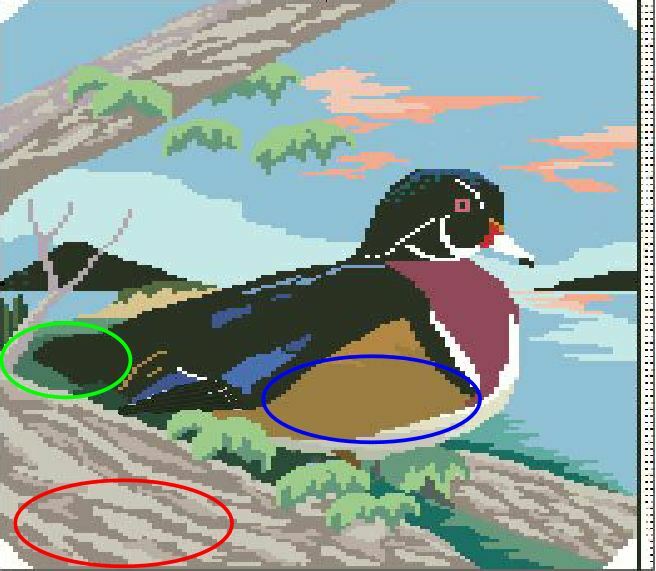 In the illustration below, the areas where I have used the blended yarns are marked with circles of various colors. The red circle indicates the Steel grey/ Iris heather mix. The next combination in the green circle, is a teal/dark green mix. The blue circle marks the side of the body. In this section I chose to blend the Suede color with gold. This combination allowed me to transition to the single gold color without a definite line. All this is to say that you don’t have to settle for the color combinations that are out there. You can blend your own. 1. Select you colors. 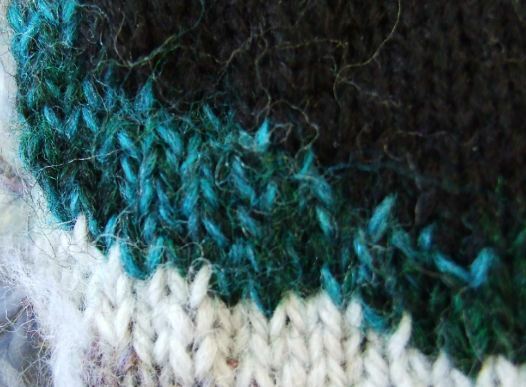 Peel off the amount you normally use in your colorwork ( I use about an arm’s length). 3. Tie one end of the two strands together. 4. Lay the joined end of the two strands in the palm of your left hand. inotherwords, “spit splice” the strands together. 6. Wet your right palm again, now push down on the combined strand and roll it away from you about 5-6 time. This sets the twist. 7. 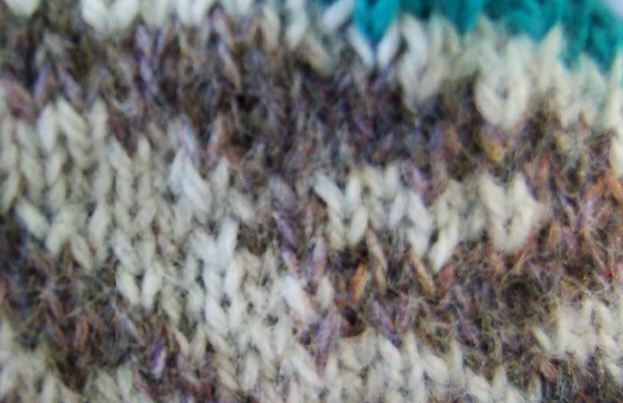 Move the blended strand to the left, so you can work the same process in the next section of yarn to your right. Be sure to repeat the same number of rolls when setting the twist. Continue this process to the end of the strand. * If you find an area that didn’t get twisted enough, just wet you palm and work a few more rolls at that point. Next time you can’t find the color you need, you might try this out. It’s fun to see what color combos you can come up with. When I need larger amounts, I use a drop spindle to re-spin the two strands together.